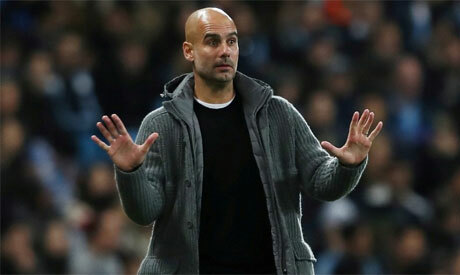 Manchester City manager Pep Guardiola said his side had to overcome early "fear" before the reigning Premier League champions returned to the top of the table with a 3-1 derby win at home to Manchester United on Sunday. Goals early in each half at the Etihad from David Silva and Sergio Aguero left City in a commanding position before an Anthony Martial penalty gave visitors United hope of a comeback. Victory left City two points clear of Liverpool and Guardiola told the BBC: "We deserved the victory. The first half we played a little bit with fear but football is a game and we didn't want to lose the ball." Asked why his team had been fearful, Guardiola replied: "We wanted to play good in front of our fans and we know how important it is to play in this game. But we did well and that goal from Sergio Aguero helped us a lot after half-time." He insisted his team were united in reality as well as in name, while saying all three of City's goals were down to mistakes by his players. "For me zero words against my players, everything is positive," Mourinho said. "I am with them and they are with me. "There is a gap, Manchester City start playing from the beginning of the season at a certain level that allows them to get a lot of points." The Portuguese boss, in a separate interview with Sky Sports, added: "All three goals are our mistakes. Against a team like City, if you make mistakes you will get punished." United scored twice in the closing five minutes to win 2-1 away to Juventus in the Champions League in midweek while City continued their campaign in European club football's elite tournament with a 6-0 thrashing of Shakhtar Donetsk on Wednesday. Mourinho, while not blaming United's defeat on their exertions in Italy, said: "Everybody has to agree, it is one thing to go to Juventus and play against one of the best teams in the world for 90 minutes, another thing to beat Shakhtar Donetsk at home 6-0 and be very relaxed. "We arrive in different circumstances."